Wild: Oviraptor Philodator is a small-to-medium sized carnivore, common in the jungles and beaches of the island. Despite being a carnivore, Oviraptor’s primary source of food is eggs, which it steals from nests. Unlike any other creature, Oviraptor seems to be able to surreptitiously steal these eggs usually without attracting the attention of the irate mother. Known Information: In an incredible feat of natural selection, Oviraptor seems to emit a chemical pheromone that affects many creatures as an aphrodisiac. 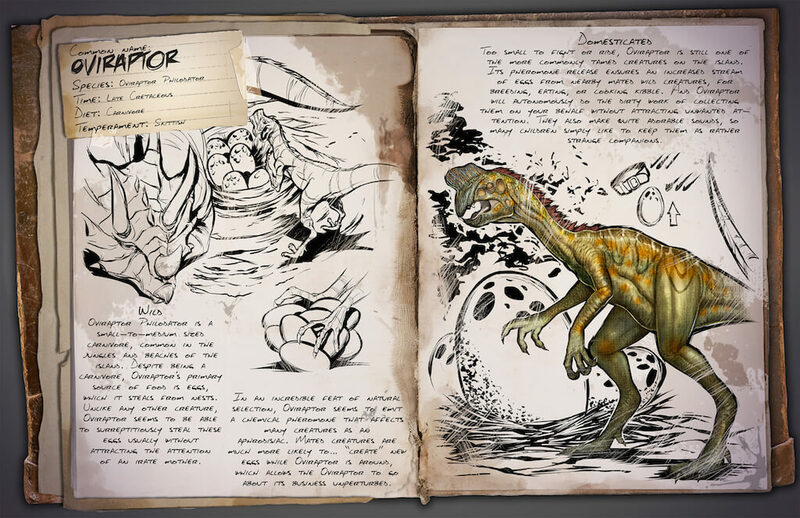 Mated creatures are much more likely to… “create” new eggs while Oviraptor is around, which allows the oviraptor to go about its business unperturbed.